nÃ¤kyvyys: Where did this idea come from? J.F. Culhane: The idea for Radio Free Blissville came out of a longer script where a main character Crosswell is living in two separate worlds simultaneously. One of these worlds is a false world, and the self deception proceeds to catch up with him. He finds himself aligning to a pirate radio cult. It is here he finds his true voice. JFC: Blissville is actually a small part of Queens near Long Island City that was once apparently a Gypsy village. I believe itâ€™s now the Calvary Cemetery. Strange place. n: What does pirate radio signify? JFC: The thing about pirate radio which Iâ€™ve always been attracted to was that itâ€™s akin to some kind of magic. There is an untraceable voice that is emanating out of the noise. It may be there one day, it may disappear the next. You may think you hear it. Itâ€™s instantly mythical. Itâ€™s slightly insane. Itâ€™s independent of everything youâ€™ve been told. You donâ€™t control it. I suppose there is almost something religious about it, in that anyone who is chosen by god hears voices. There is a fine line between religious fervor and pure madness because itâ€™s all invisible. n: Are we better off without technology? JFC: The role or dependency technology plays in the modern world is a heavy concept in this short. I wanted to explore what would happen if our methods of instant gratification and overload through technology disappearedÂ overnight. I discovered this Achilles heel though satellites. I realized that if that entire system was brought down and an informational house of cards collapsed, the average modern person would be utterly disoriented. n: Are the characters supposed to be absurd? JFC: The humor in the short comes out of the fact that people will always survive and adapt. They will always rise above the absurdity and devastation of a situation. They might be in shock, but some peopleâ€™s instincts are only to survive and not look back. I realized during 911 in New York that after the initial shock wears off of something cataclysmic you really donâ€™t want to discuss or talk about it. Maybe once a year you relive it or memorialize it, but you have to move on. Itâ€™s almost a defense mechanism. It exhausts you to stay in a past of uncertainty and confusion. I found that same kind of exhaustion with these characters. They are past talking about the disaster because they are living in it. Carl played by Joe Lihach, is the only one who alludes to it almost mockingly. Heâ€™s still angry and slightly worried about it. n: What were the satellites? How was that done? JFC: Satellites crashing to Earth are such an abstraction, that visually I had to come up with some interesting effects. Itâ€™s a lot to explain in the set up. Believe it or not the visuals of the explosions and the streaks in the sky were done with one of those 1970s fiber-optic lamps. A few of my friendâ€™s kids were playing around with the lamp in the dark, and I ended up shooting and processing the images. I then tried to match the colors and explosions in Maya. I gave the strange blue beam a bit of character, as if it was seeking a target although itâ€™s unclear if the destroyer is terrestrial. The music track from rebel: Nickname fit perfectly without having to re-edit the visuals. The distorted electronic music gives the 3d a more organic feel. It makes what happening more sinister somehow. n: How did you choose the talent for this project? JFC: This project was really a collaboration of many people, some of whom had dual roles. David Reynolds created the titles and also contributed music tracks via his organization the Center for Audio Visual Research. Baqi Shaeed who plays Ernie also contributed the hip hop track via A.B. Dowell towards the end when theyâ€™ve been driving for too long. Marina Neary who plays Sonya is also a writer who specializes in historical fiction and playwriting. Everyone on this project seemed to be multi-disciplined in one way or another. Very smart and talented people. n: Where did Lenoxâ€™ character come from? JFC: Lenoxâ€™s character was in the original script but we added interesting layers to him in this short tangent. He is a curious character in that his quixotic broadcasts are almost ritualistic. The actor Andrew Hampsas brought a lot to this. We would also do improvisations where he would just improvise as we drove around. Another trait that developed was that Lenox is somehow incapacitated or disabled. He never leaves the car. He is only free when heâ€™s being driven around doing his broadcasts. He needs to do this. He hints about breaking his back, but you cannot tell if he is exaggerating. 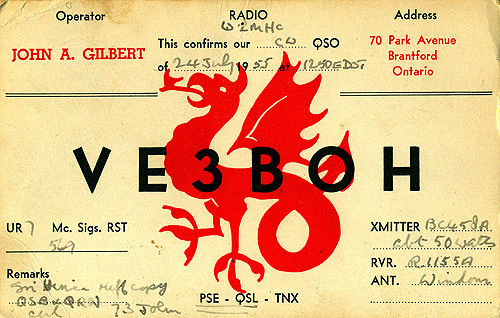 In Brooklyn a few years ago I found an entire box of old Shortwave radio QSL calling cards that were all traceable to someone named Vincent Dembowski who had lived in Brooklyn. There were hundreds of cards from all over the world. Back in the 1950â€™s the goal was to get as many of these cards from people who heard your shortwave broadcasts. On the cards they would write who they were and the actual details of the signal. I get the feeling that a lot of these DIY radio fanatics were ex radio guys from WWII or Korea. Thatâ€™s how they learned the technology. I also read somewhere that it was a liberating hobby for people who had physical disabilities. They could go anywhere via their radios even though their bodies couldnâ€™t. n: Why are there different versions of the piece? JFC: I found that I needed a shorter version of the entire project for festivals, but Iâ€™m also very interested in the idea of mashing up versions of the narrative and experimenting with deconstructing the events and the set up. Interesting accidents always happen when you step back. This is really the first pure digital film/video project that I look at more like software or one that yields derivatives like traditional storytelling. I see the versions like branches. It would be great to have people contribute their own interpretations and accidents. The audio became experimental in that what we are hearing is triggered by Lenox. Lenox is manipulating his voice or adding echo. Heâ€™s constantly tinkering. It gives him and his audio a certain unpredictability which makes anything possible.